This article originally appeared at Blue State Digital. I’m never using the word millennial again. Well, I’ll be using it in this article, but after that? Done. Forever. More specifically, in my role as a strategist, I won’t allow my team to use millennials as a target segment in our strategies or advertising — and you shouldn’t either. 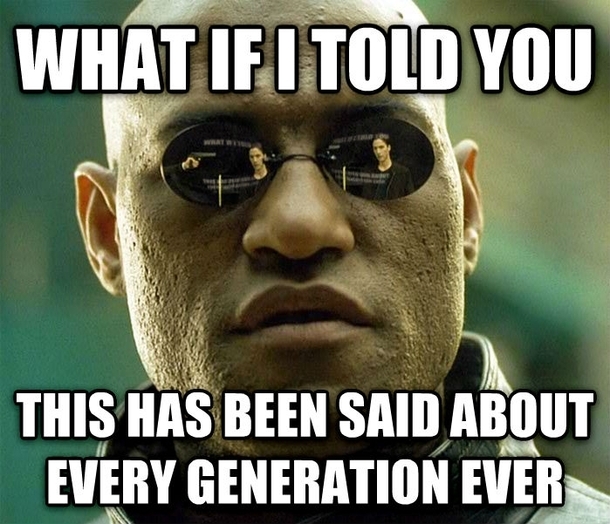 There are as many articles written about how to target millennials as articles advocating against it. Most of these generalize millennials as narcissistic but authentic or self-obsessed but altruistic, which leaves us with more questions than answers. What if these articles describe me? What if they don’t? Am I or am I not a millennial? What is a millennial beyond an arbitrary group of people born in the United States between 1980 and 2000? From the news, we hear that millennials don’t buy cars or houses (and how could they when there are experiences to be bought and paid for?). We also hear that millennials buy cars and houses (probably to go home to after those experiences are over). At the end of the day, none of this really matters. People born between 1980 and 2000 are the largest demographic cohort in America today, roughly 40% of the country. Assuming that each of those 92 million Americans acts, believes, consumes, or purchases exactly the same leads to advertising for everybody, which, as a result, becomes advertising for nobody. Let’s make a pact. Starting today, let’s match our cutting-edge technology with more sophisticated thinking. Big data, cloud computing, and predictive analytics are advancing every facet of our lives. Broad generalizations about demographic groups defined solely by age, race, or location become irrelevant and useless. A 24-year-old is not the same as a 24-year-old is not the same as a 24-year-old. There’s a better way: let behaviors be your guide. Instead of focusing on demographics, focus on the the desired goals and outcomes of your marketing and build segments based on behaviors and actions, regardless of demographic characteristics. A unique set of needs or desires can be identified, which in turn defines a unique set of channels to consume and actions for users to take–regardless of age or location. I know I’m not the first to say this, but it’s still surprising that marketers continue to rely on broad demographics when targeted, personalized advertising is significantly more efficient and effective. Why spend time and money advertising to people who will never care about what you’re selling? There are countless ways to dig into behaviors, but here are three simple tactics to give you a jump start. First, CRMs and analytics tools can give you insights into which tactics drive individual behaviors, such as calls to action or tone. Second, advertising platforms like Facebook or Quantcast can provide countless ways of slicing audiences by traits including (but astonishingly not limited to) life situations, political affiliation, family history, and more. Lastly, and most importantly, don’t forget to take things offline and have an old-fashioned conversation with your customers, regardless of their age. You’d be surprised what they want you to know about their emotions, desires, and universal truths. One final note: I’m not saying millennials do or do not like memes — I’m saying that there’s a much more specific, ideal audience segment to whom you should advertise your particular meme more effectively. As marketers and communicators, don’t rely on tired tropes to drive your business goals. There’s a big, beautiful world of people out there, and it’s our responsibility to make sure we find our small and exact place among them.